Virginia Tech researchers are gathering valuable information about the impact of pesticide exposure on honey bee colony health in Virginia, helping both the apicultural and agricultural industries to reduce the loss of managed bee colonies. Honey bees allow for the production of important crops such as apples, melons, and squash in the commonwealth of Virginia, but hives are collapsing at an approximate rate of 33 percent per year, according to the United StatesDepartment of Agriculture, and continued losses are expected to drive up food costs. Despite active research efforts, a fundamental explanation for bee colony losses remains unclear. Funded by a $1.4 million grant from the Virginia Department of Agriculture and Consumer Services, Anderson is engaging in the five-year study with Richard Fell, professor emeritus of entomology and Carlyle Brewster, professor of entomology, in the College of Agriculture and Life Sciences. Funding for this grant is from pesticide fees collected by VDACS’ Office of Pesticide Services. No taxpayer dollars are used. Together, the team will employ Anderson’s toxicology background with Fell’s expertise in apiculture and Brewster’s talent in quantitative ecology. 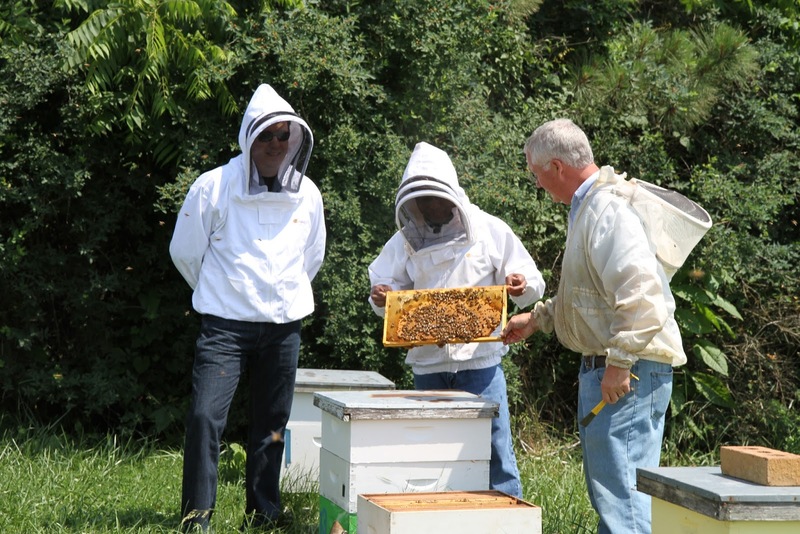 They will seek out beekeeper participation in six agricultural regions of the state– Winchester, Virginia Beach, the Eastern Shore, Suffolk, Petersburg, and Blacksburg– and partner with Virginia Tech Agricultural Research and Extension Centers when possible. “At each of the regions, we will examine various hive components such as wax, pollen, and the bees themselves to assess the levels of within-hive pesticide residues, and colony health and nutrition. The multitude of data collected will then be analyzed using multivariate statistical methods to determine the extent to which bee colony health profiles are related to the pesticide residues in Virginia,” Brewster said. Since the 1940’s, the number of hives in the United States has been halved from 5 million to 2.5 million, according to the United States Department of Agriculture. Colony decline worsened in the 1980’s with the advent of pathogens and pests, and even more in the 1990’s, with the invasion of Varroa and tracheal mites.